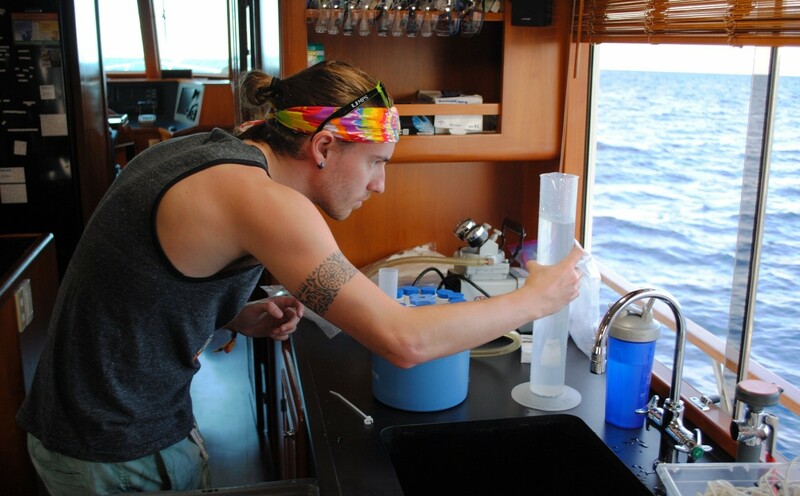 Ryan Schlaiss measures a liter of seawater for chlorophyll analysis in the lab on board the R/V Angari. Participants of the Florida – Bahamas trace metals cruise aboard the R/V Angari upon returning to port. Left to right: Tim Conway, Angela Rosenberg, Kevin Davidson, Ryan Schlaiss, Brent Summers, Peter Morton, Travis Mellett. 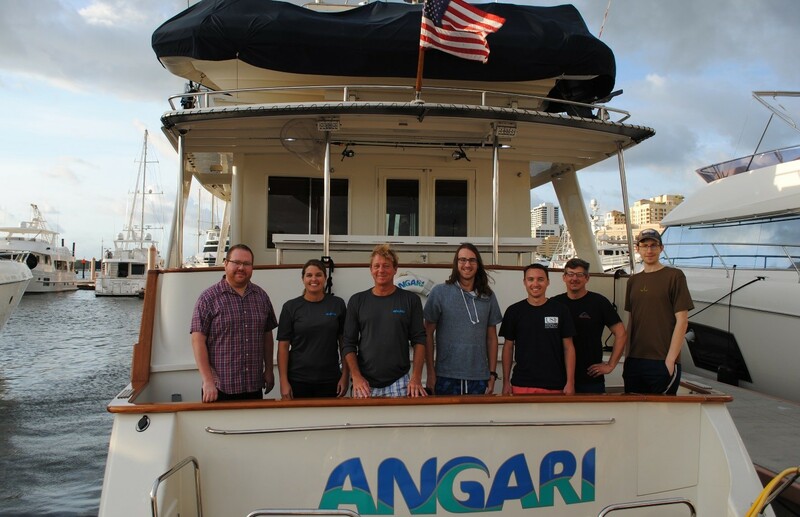 WEST PALM BEACH, FL – Following some smooth sailing and testing of experimental equipment on Day 1, the R/V Angari saw plenty of science in action on Day 2. 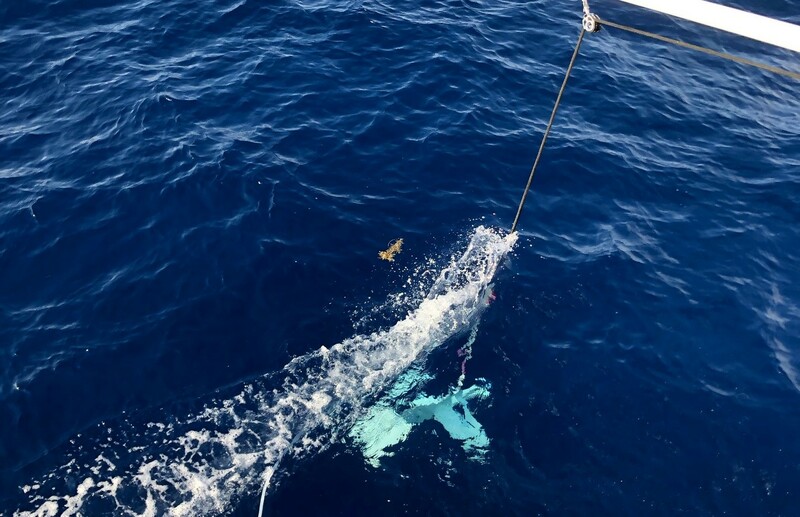 On the return trip, the scientific crew sampled over 30 stations across a portion of the Gulf Stream between West End, Grand Bahama and West Palm Beach, Florida. Seawater samples from the cruise will be analyzed for a variety of characteristics with a focus on trace metals: elements that are essential to life despite their low concentrations in the oceans. 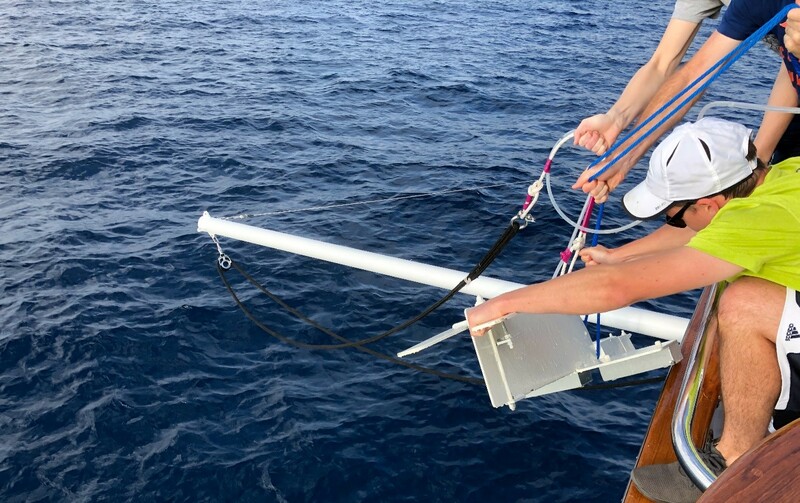 Although researchers like Dr. Tim Conway and Dr. Kristen Buck from the USF College of Marine Science (CMS), and fellow researchers from a program known as GEOTRACES, have their hypotheses about the Southern Gulf Stream, no one has ever sampled this important oceanic location for trace metals. The Gulf Stream, an ocean current with an equivalent flow of 5000 Mississippi Rivers, transports seawater from the Gulf of Mexico, up the Eastern U.S. seaboard and across the North Atlantic Ocean to Europe, as well as into the Arctic waters around Greenland. This massive transport of warm waters is a major player in regional and global climate, but from the perspective of a trace metals researcher, it represents a source of iron and other micronutrients to the North Atlantic. The clear waters of the Gulf Stream are not especially laden with deposits from land sources, and so the concentrations of most trace metals are expected to be very low. However, expectations don’t really carry that much weight in science…Peer reviewed journals don’t publish expectations – they publish results. Hence the purpose of this exploratory cruise aboard the R/V Angari to the western tip of Grand Bahama. High seas in the forecast for Wednesday evening bumped the cruise departure up to Monday afternoon (March 11th), and sampling, which requires slower speeds, was confined to the return leg of the trip on Tuesday. After spending a bit of time clearing customs on Tuesday morning, the Angari steamed out of port, headed home to West Palm Beach. Travis Mellett, a Ph.D. student in Dr. Buck’s lab, and Brent Summers, an M.S. student in Dr. Conway’s lab, set up shop in the laboratory space of the ship. The “clean bubble” they constructed while underway on the previous day comprised a plastic laminar flow cabinet with plastic sheeting draped around the sides. The bubble allowed Mellett and Summers to filter seawater into sample bottles while preventing contamination to the highest degree possible on a boat full of people and, well…things. In the trace metal world, contamination is such a big concern because even a bit of dust entering a sample bottle can alter the concentrations of some of the trace metals being measured. Shipboard setups generally cannot replicate the clean labs constructed back on shore, but all precautions are taken to minimize the chance of dust, skin cells, etc. entering a sample bottle. Recent Eckerd College graduate Ryan Schlaiss, who will be joining Conway’s lab as a student in the Fall semester, kept very busy, measuring seawater conductivity, temperature and pH on the back deck of the Angari and then immediately moving inside to filter seawater for dissolved macronutrients (nitrogen and phosphorus) and particulate chlorophyll. Also on board was Dr. Peter Morton, a visiting oceanographic researcher at Florida State University (FSU) and trace metal chemist who served as an advisor to Summers’ during his undergraduate work. Captain Angela Rosenberg, and first mate, engineer and chef, Kevin Davidson, deserve a big mention here as their multi-faceted roles aboard the ship played an integral part in the success, and safety, of the scientific mission. Once all duties were administered, everyone assumed their positions on the boat and prepared for the first water samples, which would come courtesy of flexible tubing connected to “the Fish,” a towed sampling device rigged to a boom on the port bow of the Angari. With more than enough work to keep everyone busy, I had the opportunity to assist with a few simple duties, which gave the students in the ship’s lab just a bit more down time between each sampling station. Emphasis on “a bit,” and added emphasis on the credit due to Mellett, Summers, and Schlaiss for working continuously from the first to the very last sampling station. Just about the time everyone became truly comfortable in their roles and started to auto-pilot, the weather picked up and the seas began to slosh. With rolling seas, there was now more to occupy the mind, lest any bouts of boredom overtake the researchers between rounds of sampling. Like, preoccupations such as making sure the sample bottles didn’t slide out of the clean cabinet, or, taking each step carefully so one does not go crashing into a shipmate or into the next room on the boat. Eventually, the seas increased to the point where the captain and chief scientist (Conway) both felt it was time to pull the Fish out of the water and stop the sampling. 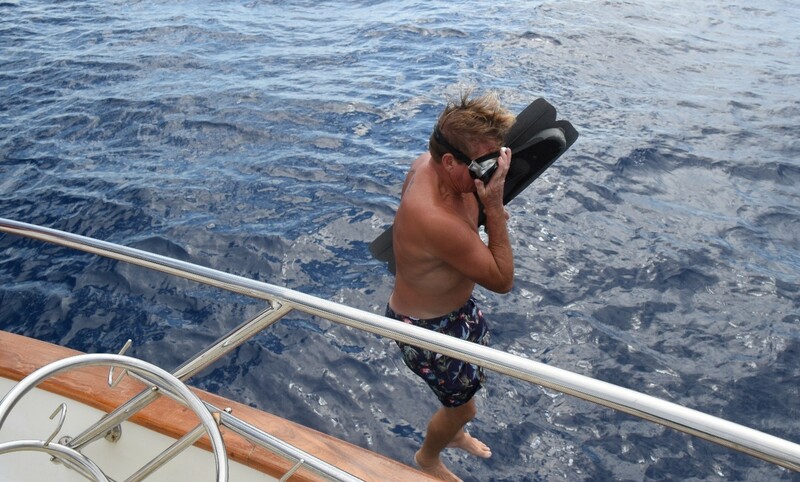 Waiting much longer would have jeopardized the chance to safely haul up the heavy Fish and would have also increased the chances of the Fish knocking against the hull of the boat as waves moved the ship back and forth. A few of the stations closest to land on the Palm Beach side of the transect remained unsampled, but over 30 stations were completed successfully. The high sampling resolution will give researchers looking at the data in the future a better glimpse of the trace metal concentrations and isotopic ratios in the Southern Gulf Stream. Analysis of the small mountain of bottles containing seawater will be divided among a few laboratories. The Buck lab will use a seaFAST (Elemental Scientific) and an Element XR ICP-MS (ThermoFisher Scientific) to analyze dissolved trace metal concentrations (Fe, Cd, Zn, Cu, Mn, Pb, Ni). Also, the presence of iron binding organic molecules (ligands) will be determined by voltammetry. The Conway (MarMITE) lab will use a Neptune multicollector ICP-MS (ThermoFisher Scientific) to analyze the samples for dissolved trace metal concentrations and stable isotope ratios (Fe, Zn, Cd, Ni), and Schlaiss will measure chlorophyll concentrations. Dissolved organic nitrogen, nitrogen isotopes, and macronutrient (N, P, Si, ammonia) concentrations will be analyzed by collaborator Dr. Angela Knapp at FSU. In addition to papers that will be written by members of the scientific party on the cruise, there is undoubtedly the potential for many studies to be conceived and papers written based on the data that will be made available from this USF Research New Researcher funded project.